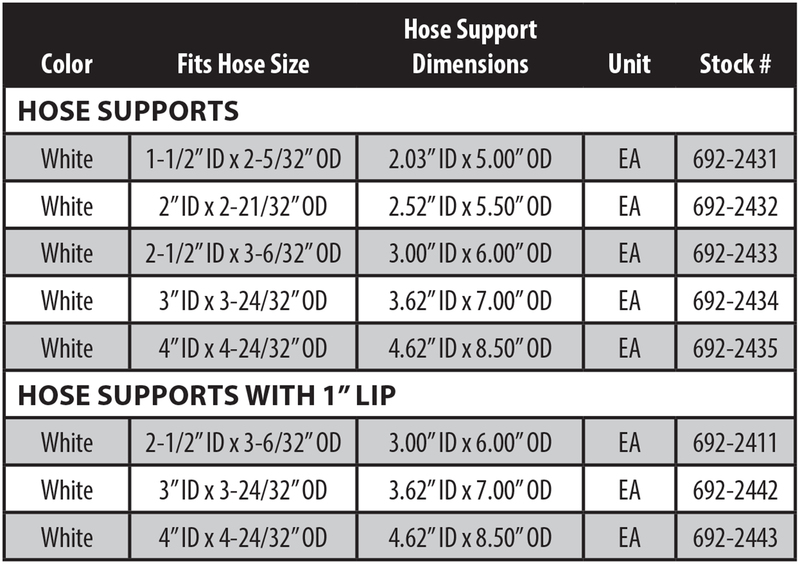 HoseGard Hose Supports provide protection that helps increase the service life of your hose. Their durable HDPE construction resists damage from chemical, washdown or harsh environments. The lightweight, two-piece design with stainless steel socket head cap screws installs easily on your hose, stays in place and allows the hose to slide across the floor. The built-in handle facilitates movement, placement and carrying of the hose, while protecting workers from ergonomic-related injuries and associated costs. Designed for use on rubber hoses. Compliant with FDA 21 CFR 177.1520. Stock color is Blue but also available in Yellow. NOTE: Sized to fit the OD of our rubber hose. Order size needed according to ID size of hose. Keep hoses off the ground, allowing them to remain clean, reduce wear and tear on cover, and prevent damage to end connections with hose supports. Ultra-high molecular weight (UHMW) polyethylene material allows hose assemblies to slide freely while being moved. Extremely durable and little or no water absorption. Stainless steel screws and nuts are counter-sunk into the UHMW. Larger sizes available with 1" lip to increase stability. NOTE: Sized to fit the OD of our rubber hose. Order size needed according to ID size of hose. • 0.984″ O.D. is the same for 1/2″ and 3/4″ I.D. styles. • 1.984″ O.D. is the same for 1″ and 1-1/2″ I.D. styles. • Varying O.D. for the 2″, 2-1/2″ and 4″ I.D. styles.